Bolivia is famous for its cocaine trade and altitude. 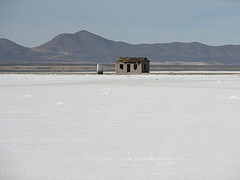 Whilst this may seem a little daunting for some, I actually found Bolivia quite safe even though I was travelling solo. Mind you this was about 7 years ago, but I never felt scared or threatened. 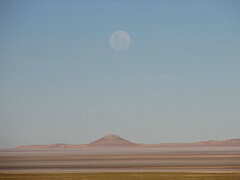 Quite the contrary, I loved Bolivia for its spectacular landscape and adventure tourism. One place that is a little out of the way from La Paz but well worth the detour if you are in the region are the Uyuni Salt flats (Salar de Uyuni). It’s easy to feel like you are in the snow here, after all you are about 5,000 metres in the air, it is freezing and everything around you is white. Alas, there are no snow men up here, just salt as far as the eye can see. This is completely surreal and one that encouraged me recently to take my parents to Kutch to see the salt flats there. Thankfully we didn’t have the same misfortune there that I did in Bolivia. Travelling along this inhospitable terrain, our jeep got a flat tyre, not once but twice! Surrounding the salt flats is the most surreal landscape I have ever seen, it was just how I expect it would look like on the moon. Dusty, desolate and isolated; random rocks that look like god has just thrown them of the sky. Then of course there is the sunset. With the salt still heavy in the air and the dust working its way across the horizon, the sunset was just surreal. I took this photo below just before it became dark, it is still one of my favourite pictures. The region is also famous for a stretch that is known as “The Valley of Dali” because it resembles a painting of the surrealist artist. I just adored this part of Bolivia, it was peaceful, quirky and confusing for the senses; it challenged my sense of reality. One minute I felt like I was in a desert, yet I was freezing and struggling to breathe due to the altitude. The next minute it was like I had fallen into a painting and was wandering through it at close range. It really is somewhere that needs to be seen to be believed. Closer to La Paz, the ultimate in adventure thrills would have to be the notoriously named “Bolivia Death Road”, also known as the “World’s Most Dangerous Road”. 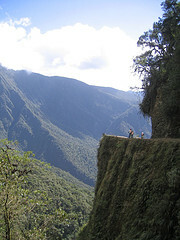 Yungas Road gained its reputation because of the number of fatalities that occur on it. Why? Simply this 60 kilometre stretch of road is very narrow and clings to a very steep mountainside. In most parts it is only possible for one vehicle to pass the road at one time, yet it is also a truck route. So if you are driving or riding on the road and you meet another vehicle, one of you must reverse back until the other can pass, this can be kilometres in some spots. One wrong move and you can be off the edge falling 200 metres to your fate. It is estimated that 200-300 people lose their lives on this road each year. So of course, I had to ride a bicycle down this road. It was exhilarating! Slightly terrifying but thrilling nonetheless. Would I do it again? Probably not because what I hadn’t realised was that the only way to return to La Paz, once you had cycled down the road, was to either cycle back up it or take a bus back. I took the bus back and it was getting dark by the time we hit the road. That bus ride is undoubtedly the most terrifying drive I have ever taken. There were numerous times I looked out the window and could see nothing but a sheer drop. I saw the world’s most dangerous road on a Top Gear special. It is insane! Must have been quite an adventure. And hats off to you for taking a bicycle, of all things, on it.